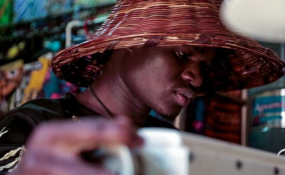 Nairobi — You can easily pick out David Ochieng from a crowd not just of his signature conical reed hat, which has become part of his identity, but also for his infectious warm personality that can musk the fashion designers' difficult past and ambitions. Growing up in Nairobi's Kibera slum, David's love for fashion was partly ignited by watching his mother work as a tailor and partly due to his curiosity to learn new things while still in school. But it was lack of school fees - which saw him drop out later - that pushed him to the colourful, creative world of fashion design. "You know I was forced to grow up quickly. I learnt how to sacrifice at a young age. My mother was struggling to raise four of us single-handedly. I just had to bury the 8-4-4 system," he said, referring to Kenya's education system. As his passion for fashion design started taking shape, David started knocking on doors that would allow him to pursue his dream but the fact that he hadn't finished high school limited his choices. "Things turned around when a good Samaritan offered to pay my (KCSE) exam fee so that I could get a certificate and that's how I joined Buruburu Institute of Fine Arts to study fashion design," said the 24-year-old. "I work best at night where there is little disruption," he said. The house was neatly arranged as some of his work could not go unnoticed in the single room. Despite the limited space, David is proud of his humble workshop home, often insisting that his clients come to his 'office' for fitting. "Honestly, I did not believe that I was going to start a business with just Sh200. All I wanted was something different in life and to take care of my siblings," said the first born in a family of four children. "You know it was not that hard for me to attract the international market. I ensured I did a good job in all my pieces so that one would want to know who made this. They just come here in my bed sitter I take their measurements and finish within the duration of time given. Some cannot make it all the way, so I must go to their hotels and start my work," said David. "I want to employ people especially the youth who have struggled and explore their talents just like I have. Here in Kibera most of us go astray because we lack people to support us and lead us in the right direction. I want to show people that good things can come from the slum," he said. "People often laughed at me because my shorts were torn and that hugely affected my self-esteem. I feel compassion when I see children going through what I went through that's why I won't move out of Kibera no matter how much money I make. I don't want to forget where I came from," he added.